Hearing how these fences (or lack thereof) impact local communities intensified our push to strengthen our borders! I visited both good and bad barriers on Sunday, which pushed me to share with you what is actually going on. It really is a mess! I need to hear from you on our petition for building borders. Illegal immigrants quickly learn how to game the system. Mexicans know to claim that they are from another country and to avoid being turned away. The “catch and release” program wastes our law enforcement’s valuable time before forcing them to drop illegal immigrants off at the bus station! Along the way, a devastating number of women and children are being sexually abused during their journey to the U.S. Men, trying to enter our country illegally, are encouraged by current laws to bring their child on the trip because if they have a son or daughter with them, they must be released into America within 20 days. There is little to prevent them from kidnapping a child and, after making it across the border, then disposing of them! This is a dangerous trip filled with death and destruction! Having open borders breaks apart families and hurts innocent young children who become pawns of their parents or tickets to strangers on this dangerous trek. We must end this now! 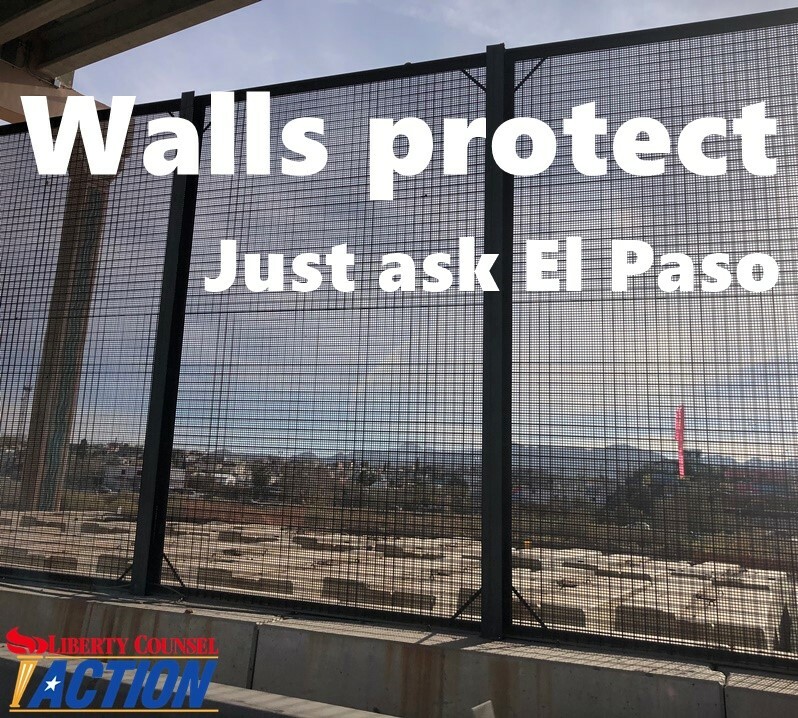 Sign Liberty Counsel Action’s petition to President Trump encouraging him to stand strong for border security! $5.7 billion for a fund a steel barrier system in the priority areas, including embedded investments in technology and roads. $805 million to help stop the flow of illegal drugs, weapons and other contraband through for drug detection technology, canines, and personnel and portable scanners. It isn’t cheap to protect our borders, but it is significantly cheaper to build the wall than to deal with the fallout from not having it! It is better both economically and morally to protect our borders. Liberty Counsel Action is actively educating and advocating for increased border security. We are on the front lines of this battle! Partner with us by donating $50, $100, or $500 dollars to help us win this important fight. P.S. Right now is the best chance in decades to have strong border security. Democrats know this and are willing to sacrifice the safety of Americans to keep President Trump from a victory. Don’t miss this moment. Sign Liberty Counsel Action’s petition to make your voice heard!